We are a football family. Our football of choice is Australian Rules, which makes our sacred turf the Melbourne Cricket Ground (MCG), our referees umpires and our ball an ellipsoid. I know M1 and M2 should be free to choose if they are interested in football but at this point in their lives we’re not giving them any liberty. The clichettes have been members of the Sydney Swans since they were born. Actually M1 was a member before she was born – she was listed as ‘Baby’ Golland and she was a boy. This isn’t to say footy is everything. However, from March to September each year, the Cliche and I do plan our outings around when our teams are playing¹ (mostly). In 2005 and 2006, before we met, I was so committed to the cause I would turn down social invitations which clashed with any Sydney Swans matches. I was either at the game, at a pub with a game playing on the big screen or at home in front of the television watching the game. Fortunately my friends understood (well at least to my face they said they did) this passion. A few who didn’t wondered why it couldn’t just be on in the background while we dined! I was so committed I even wore the same outfit to every match. They payoff was that one day in September. Since then, there have been travels, weddings, babies and still there is footy. This commitment, love, passion, obsession – whatever you wish to call it – is a bizarre thing for me. A real juxtaposition. In 2001 I wrote a post graduate thesis based on Herbert Marcuse’s notion of ‘One-Dimensional Man’. As part of my ‘seminal work’ I considered that ‘societies generate artificial needs, giving the working class a false consciousness in which the pursuit of consumer goods distracts from the realisation [sic] of class interests’². Marcuse was also concerned with people seeing themselves in the things they commodify. However, as he states, … ‘Geist and knowledge are no telling arguments against satisfaction of needs’³. Hence, I understand my need for football is a distraction from needless wars fought in poppy-ridden countries – wars, personed by my working class colleagues. I understand football teams are sponsored by banking institutions which may not be looking after the best interests of my working class comrades, but rather the interests of those who can afford to sit in a corporate box. I understand how three hours of footy watching could better be spent questioning government need to cut spending on community housing, education and the public sector generally, especially as a taxpayer who believes in these things. All these hours could be spent investigating the business practices of corporations where I spend my spare dollars, to ensure I am supporting those with good ethics. Marcuse is right! No matter how much ‘Geist’ I put into it I am fully immersed in my commodification. Maybe now is the time for change. Maybe I can start to work on greater realisation of class interests. But it has to wait until after this weekend. 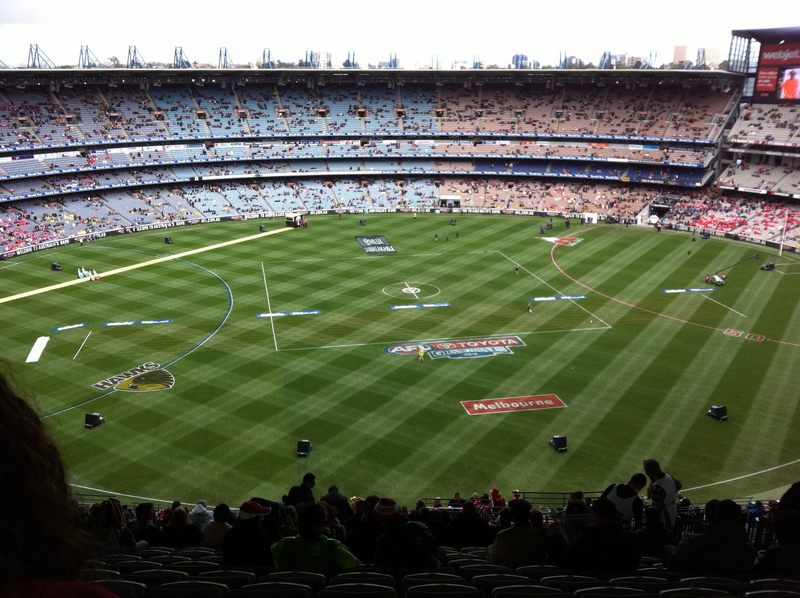 For this weekend, I will be devoting my time to the mighty Sydney Swans on Grand Final day. As I sit in my seat, high in the bleachers at the MCG, with my red and white layers and my words of wisdom for those dressed in green (or whatever ridiculous colour they put the umpires in this year) I will take comfort in the knowledge those with similar class interests sitting with me are also distracted. And together, we can scream for our team over the heads of those in the corporate boxes. ¹ For the record, the Cliche and I support different teams. ² The Penguin Dictionary of Sociology, 2000 p.211, Penguin Books. ³ Marcuse, H. One-Dimensional Man, Chapter 2, Boston: Beacon, 1964. Posted in Uncategorized and tagged AFL, commodification, footy, Marcuse, Sydney Swans. Bookmark the permalink.